[melts into an oozy, squishy little puddle.] If this guy were an animal, he’d be one of those adorable, floppy little auburn puppies. Who gives a flying squirrel about Smith and his conventional macho-ness? Thomas is without a doubt the rightful heartthrob of Pocahontas. He’s innocent and clumsy and victimized and naïve and… Thomas. Now look at that picture, listen to that voice, and deny him a swoon. I dare you. "Put him in chains...and GAG him, as well!" I know it's not just the eerie resemblance to Thomas and Dmitri that made me fall so hard for dear Scott because I was already in heart with the James Marsden version (at least in the first movie, which really is the only movie he's truly in, thanks to some rather unfortunate plot points and an overwhelming fan preference for certain other characters), and I was in heart with the X-Men: TAS version way back when I was just a wee Gosling. But the X-Men: Evolution version makes me completely forget about the others because he is just that fantastic. No, sorry, that's the other alliterately-named Marvel superhero I fancy... Scott is...uncanny? Something like that. Whatever he is, I like it. A lot. He's cold and aloof and intelligent, which I LOVE, but he's also sweet and sensitive and impetuous. He's got a way with sarcasm that is almost unmatched in Saturday morning action cartoons. And while he can occasionally be pretty clueless about interpersonal relationships, he actually does listen to people. He's a little too much of a morning person, and he's a teeny bit too teenagery, but otherwise, I don't have anything to complain about. And thus I heart him muchly. I love rodents. I have become a bit of an Anglophile. I am a total sucker for intellectuals. And Basil is all these and more. The exact moment that I fell in love with him was when he was sitting on the window sill at the toy store, pondering his adversary’s method of entry and swishing his tail back and forth. "There’s always a chance, so long as one can think." "How can I stay mad at a girl who apologizes on a blimp?" "Come on, Bronx. No sense staying up here where it’s safe." He's just so...stiff. I believe he used the word “wooden,” actually. And they don't come much more dedicated. Or interesting. You wouldn't think that there would be much extra room in that sports jacket, but he's got one heckuva trick up his sleeve. Puck is just...Puck. I loved him in Midsummer, but let's face it. Stanley Tucci has nothing on Brent Spiner. And he's so...cute when he's working with Alex (how many ellipses do you think I can jam into one blurb...? ;-)) My dearest darlink sister put it best, I think: "You should put Owen in [your harem] because he has a stone fist. That's awesome." "You mean that creature is still out there, it has the money, it's as powerful as Goliath, and it's smarter than you?" I really wish I knew what it is about selfish jerks that makes me continually fall for them, but here we are once again. Actually, in all fairness, Church is considerably less of a selfish jerk than many of the characters I have here (::coughcoughKarnagecoughcough::), and he certainly isn’t the most selfish character on Red vs. Blue, either. He actually does seem to care about his girlfriend, even if he’s not terribly gentlemanly to her (but she definitely deserves it), and he does try to help his former teammates, even though he is severely handicapped. Beyond the fact that he seems so much more competent and motivated than everyone around him, I think the reason I like him so much is his inflections – the way he says things just tickles my fancy for some reason. "You know, I feel like I’m gonna regret this...but I feel even more like I just don’t care." I’m on a con-man kick. So sue me. I also like his cynicism. "I know, I know... All men are babies." Cunning, courageous, charming, and chivalrous, this guy really knows how to treat a lady. He’s quite skilled at disguising his voice, though his southern accent leaves a lot to be desired. I much prefer his normal speaking voice, anyway. And for some strange, inexplicable reason, I really like his tail. "We never rob... We just sort of borrow a bit from those who can afford it." Kangaroo rats are so adorable! And he’s an Aussie. And an outdoorsman. And he’s about as good at board games as I am. As much as I love "Berno," if I were Miss Bianca, he wouldn’t stand a chance. "They're perfectly harmless once you look 'em in the eye and let 'em who's boss." The only guy here who is a member purely for lust, His Karnage-itude’s got a voice and an attitude that are to die for. And I have never minded looking at a man in uniform. "My door is always open sometimes." Mysterious and suave, he doesn't give you too much information about himself and he's always cool, calm, and collected. He really seems to have a lot of fun - his dark, dangerous days are (mostly) in the past - now he's just gonna live life to the fullest. A good sense of humor, good grammar, and a totally groovy look that’s all his own round out the reasons I adore this former thief. "Let me know when you need me." Is Jodie lucky to have a guy like this or what? He’s a total sweetie, has the patience to put up with Kevin (most of the time), and he’s sarcastic. Mmm… I realize I’ve gone against my anti-jock nature, but this guy is a definite exception. "[I’ll be at the party] unless I shove an ice cream scooper down someone's throat first!" Poor guy. Poor, beautiful guy. What a burden it must be to sound somewhat like Christian Bale [switches into giggling fangirl mode] But seriously. He's sweet, guilt-ridden, and a powerful wizard-type. I've taken a liking to Captain Chaotica!! 's nickname for him: "Beautiful Elf Boy." "Dormiatis dum castellum super nubes ascendant!" This guy snuck in on the Kevin Kline bandwagon. I’m hoping that, in due time, he’ll just go away. I do like a few of his lines, and I guess he’s got a pretty good sense of humor, but I still despise the original version. "Offhand, I'd say it's the Court of Ankle-Deep Sewage." Quite likely the most well developed character I’ve ever seen (other than Helga Pataki, that is), Ramses is just too intriguing. Not a villain, at all, he just happens to have been raised under circumstances that conditioned him to believe that what he was doing was the only right path. I am incredibly glad that he wasn’t portrayed as being evil… And besides, Ralph Fiennes’ voice is just beautiful. "You were always getting me into trouble. But then, you were always there to get me out of trouble again." [prepares to be stoned] Let me take this opportunity to state my official opinion on the Jane-Tom-Daria Dilemma: The writers are evil. Jane needed him more. Either they shouldn't have teased the poor girl, or they should have left them together. But I do like him. Very much (obviously). He's highly intelligent, quick-witted, and very sweet (when he's not making out with his girlfriend's best friend). In fact, for the entire last season, I preferred him to Daria. "Normal dates are for people with no imagination." Let’s just ignore the fact that he turned his last girlfriend into a statue of gold and then let her get stolen. He means well, and he really does care about her. I want a man who would be willing to be tarred and feathered to save me... I love his huge, awkward-shaped nose, his sarcastic comments, the way he insists that he is a Mighty Pirate! despite the plethora of evidence to the contrary, and, more than any of those others, his simply gorgeous voice. I am so predictable, aren’t I...? Oh, well. I enjoy it. "We’ll surely avoid scurvy if we eat and orange." "We like to get the trial over with quickly/Because it’s the sentence that’s really the fun!" That pessimism… That dry humor… That all around sunny disposition… Not to mention his positively musical voice provided by none other than Kevin Kline. Taking that all into consideration, his gorgeous blue-ish turquoise-ey eyes and just flat out good looks are only icing on the cake. But it’s the really yummy butter-cream icing that is just so sugary and delicious that it only takes about three bites before you’re really sick. Oh, dear. Does anyone have a napkin? I believe I’m drooling. I realize that every female AND her mother is automatically obliged to fall in love with every one of Johnny Depp’s characters. While extreme popularity usually prevents me from falling for a character, there really wasn’t any hope for me with Victor. From pretty much the first frame of the movie, I knew that I loved him – he’s such a cute, timid little sweetheart, and he plays piano really well. I am so a sucker for good musicians. So, in short, I am a crushing sheep in a BIG way. "And with this candle, I will...light your mother's dress on fire." 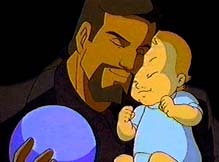 Physical attraction aside, Xanatos is a marvelously sarcastic, deliciously unpredictable antagonist. You never know what he really wants, exactly. And he is so cute with Alex... How can you look at this and tell me that he's all bad?! "Marry me. We're genetically compatible, highly intelligent, and have the same goals." Thanks to Name Your Baby by Lareina Rule, Parenthood.com, Baby Zone, and The Gypsy Joker for the name meanings.